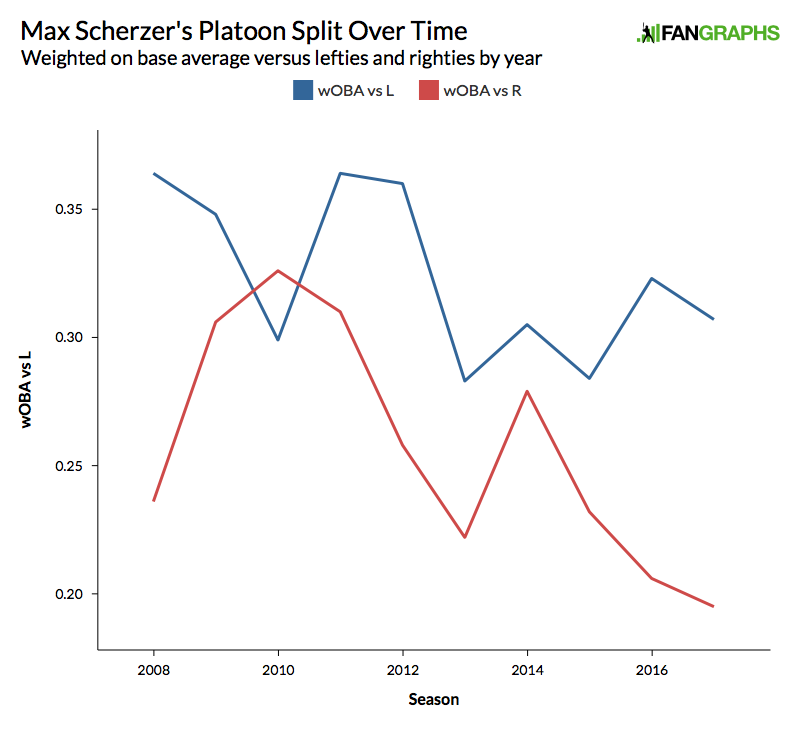 Over the last three years, Max Scherzer has kicked it up a notch, progressing from simply a very good pitcher to one of the best three in the major leagues. He attributes some of that success to an improved curveball, a pitch that has served to complement his already devastating slider. Perhaps it’s because of his curveball’s effectiveness that he’s not afraid to continue tinkering. Perhaps the introduction of a new, third breaking pitch will lead to another leap forward, if that’s even possible. Scherzer has told us before that the curve was a big deal for him. But it’s not like he just added the pitch in 2012 and stopped working on it. 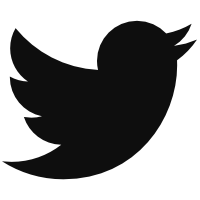 In late 2015, it took a big leap forward, exhibiting two or three additional inches of drop. But there was no change in grip or mechanics — nothing earth-shattering, at least. The pitch got better, according to the pitcher, simply because he’s “constantly getting better at it” and has benefited from repetition. It looks like what he found to improve the curve was a specific release point for the pitch itself. He found a way to mimic coming over the top, even as he released it on the side. Look at how his release point for the curve jumped up a few inches, right where it improved in drop. That’s consistent with some of my work documenting the relationship between arm slot and movement, even if that relationship usually isn’t as linear as what we find here. In other words, you don’t usually get two inches of added drop by moving your release point up two inches. In any case, the curve is better now, even if it still needs work. “There are days when I clearly have it and days that I don’t, and right now I’m working on my power slider, and you can only throw four pitches at one time really,” Scherzer said. It’s not surprising to hear Scherzer mention four pitches. According to Brooks Baseball, that’s what he throws: the fastball, the slider, the curve, and a changeup. But the fourth pitch to which he’s referencing isn’t that changeup. 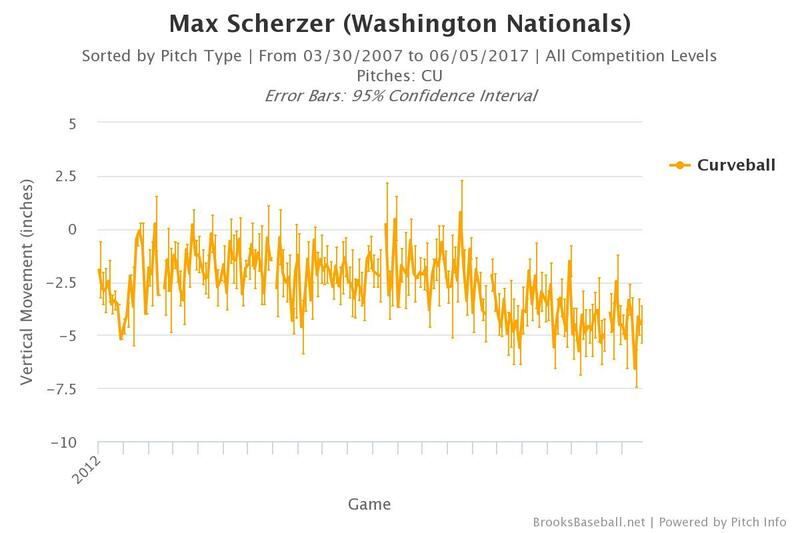 By “power slider,” Scherzer appears to be citing a whole different pitch. With the knowledge that sliders break differently when you throw them to one side of the plate or the other, let’s look at Scherzer’s sliders to lefties this year and see what they look like compared to his sliders to righties. 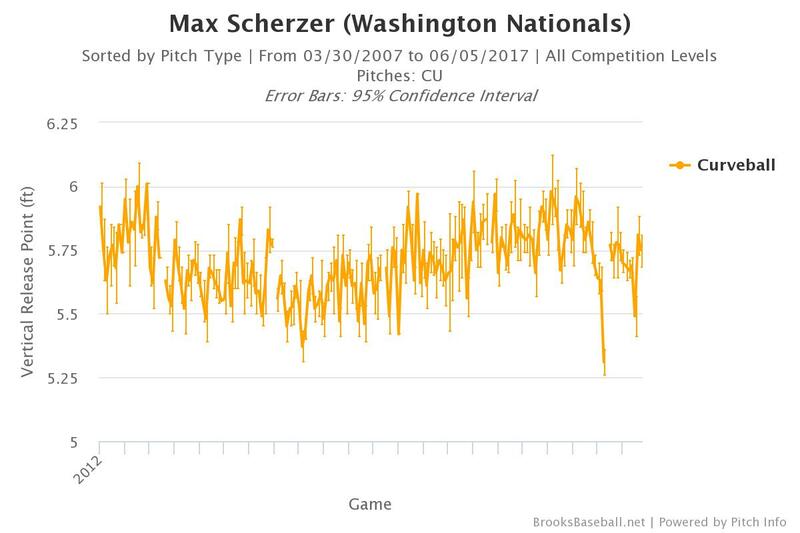 Scherzer’s nasty slider is only getting better — which makes him murder on righties, more than ever. But his work against lefties, which improved with his addition of the curveball, has stagnated recently. Maybe this power slider will be worth the risk. We hoped you liked reading Max Scherzer’s New Toy by Eno Sarris! Great read. Great pitcher. Great insights. This is why I come back to fangraphs every day. Agreed. Now if only we could get Scherzer, Grienke, and Votto to get together and talk about baseball when they are done playing, and replace the talk show hosts we usually get on tv and sports radio. Fangraphs keeps me sane. We all know it will be Trevor Bauer, Eric Hosmer and Brian McCann unfortunately. Having actually talked pitching with Bauer, I wouldn’t mind seeing him on those shows. He’s as introspective as anybody. As for the other two, we better hope Hosmer gets his big contract.